Gtalkr is a Flash-based website-enabling access to Google Talk and was launched yesterday as a beta. 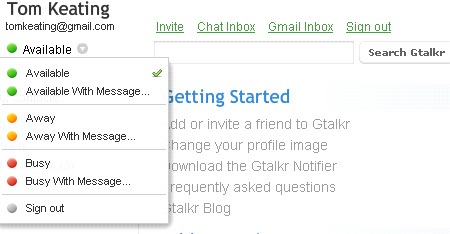 It allows you to access your Google Talk (Gtalk) instant messaging account without the software client installed, from any computer that has Flash installed. Comparisons will no doubt be made with Meebo, however Gtalkr is only for Google Talk and uses Flash instead of Ajax. The screenshot above is the upper-left hand portion after I logged onto Gtalkr. Check out this site which has screenshots and some further analysis, as well as this site. Good to see Google Google's partners are leveraging Google's API and continuing to make strides with their VoIP offering (though Gtalkr only supports IM at the moment not VoIP). Nevertheless, it won't be long now before Google uses all that dark fiber to become their own broadband VoIP company. :) Hmmm, I wonder how they'll handle the FCC's e911 mandate? Update: 10:54pm I quickly blogged this before leaving work, so I didn't check to see if this was Google's offering or a third-party leveraging Google's API and Jabber support. It looks like it is the latter. Definitely might be some privacy issues with giving your Google username//password to a third-party website even if the third-party lists a privacy statement saying they don't store your username/password. Microsoft Working on HTML5 Skype Web App?